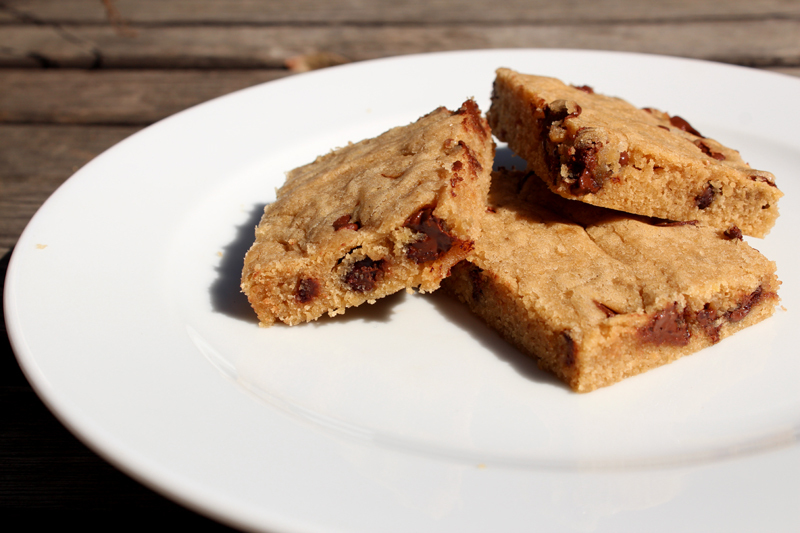 Happiness Project Recipe #2: Chocolate Chip Blondies! Since finishing Pastry School, I’ve recently become a wee bit obsessed with finding the BEST dessert recipes to tweak & re-invent to my own super snobbish version of perfection. One of these said recipes is creating a bar a bit more adventurous than a traditional chocolate brownie (though what’s NOT to love about a chocolate brownie??). Enter the classic Blondie. The wondrous thing about the Blondie is that you can add just about anything to it & it comes out tasting just the way you want it! Nuts, fruits, frosting, even a cup or so of your favorite whiskey! It’s that easy to create your own slice of personalized bliss! Drooling now, aren’t you? Here’s the recipe! One of the most important things I learned in school, was that with baking, you MUST follow recipe directions in a timely & exact manner. With any good recipe base, there’s not usually much wiggle room for change (though tweaking bits of it can be fun once you’ve figured out what your individual preferences are). So when preparing this lovely bar, remember to take heed to any specific directions. Ready? Lightly butter an 8×8 pan. Lightly, because otherwise, the bottom of your Blondies will end up being a bit greasy. Mix your melted butter with brown sugar & beat until smooth (on medium speed in a stand mixer for a few minutes). Beat in the egg and then the vanilla extract. Add the salt & stir in the flour until fully combined. If you are using any additions, such as chocolate chips, nuts, fruits etc, mix this in now. I’ll list a few of my favorite additions below. Pour your mixture into the prepared pan. Bake at 350F for 20-25 minutes, or until set in the middle. With most bar & brownie recipes, the sides will begin to brown & peel away from the edges when done. Cool completely on a rack for 20-30 minutes before cutting them. Since I’m not a big fan of flaky edges, I usually cut the browned edges off in the pan (with a small serrated knife) before I slice up the actual bar pieces. It’s just prettier (and we all know how much I like pretty things! ).